OfficeDrift™ is a for-profit and non-profit organization. We provide an exclusive clubhouse to entrepreneurs, freelancers, remote workers, and work campers traveling intercontinental in the U.S. and living an RV/Camping/Travel lifestyle. The clubhouse is a place for collaboration, partnerships, and teamwork of like-minded business professionals currently living the lifestyle. We also provide a massive selection of free and paid resources to help every day RV/Camping/Travel lifers as they go. Our remote work and work camping jobs database now has over 1 million combined work opportunities just for travelers. A growing database of rv parks in the $100 to $350 per month range with amenities for the tight budgeted travelers. Free blm/national park/nfs/army Corp of engineers/etc free boondocking and urban camping spots for those with zero budget, looking for peace in the wild, or a place to park and sleep for the night. Traveling weapon laws for each state. Free accredited educational courses from universities and colleges. A clubhouse for official club members packed with even more resources. The best RV life apps list. We have set forth on a journey to help fellow travelers find their way in a digital world of remote work, identify cost effective places to camp/park/hook-up, provide critical resources for traveler safety/comfort, and publish articles that inject each of our readers/viewers with some inspirational, educational, and entertaining content from time to time. Domain Name Discovery – (Creatively walking you through the discovery of domain names) – This series will be published in the Scorpion Agency™ Journal. 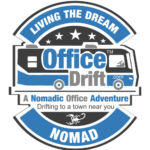 Digital Nomads – (What it’s like living and working in a digital nomadic lifestyle) – This series will be published in the Office Drift™ Journal. Online Brand Development – This is a pre-existing series that covers domain names, website monetization, business development, case studies, and more. This series is published in the Scorpion Agency™ Journal. Nomad Reviews – Raw, uncut, and uncensored reviews of various companies, services, and products that nomads have encountered in their travels. – This series will be published in the Office Drift™ Journal. Nomadic News – Nomadic news is an assortment of industry related articles we found interesting that impact those living a nomadic lifestyle. This series will be published in the Office Drift™ Journal.